There are just a few days left to apply for the current round of DHPSNY's free Planning & Assessment Services! Applications must be postmarked or received via email by Wednesday, March 1, 2017. DHPSNY awards services to a limited number of institutions in three areas: Archival Needs Assesments, Preservation & Conservation Surveys, and Strategic Planning assistance. Visit our Planning & Assessment page to learn more about each and determine which is right for your organization. Archival Needs Assessments provide assistance in archival program development tailored to specific organizational needs.Click here to learn more and download the application. Preservation & Conservation Surveys assess an institution's preservation needs, focusing on preventive care and mitigating deterioration and damage.Click here to learn more and download the application. Our Strategic Planning curriculum was developed in partnership with the New York Council of Nonprofits (NYCON) and is designed to assist small- to medium-sized institutions.Click here to learn more and download the application. DHPSNY staff is available to answer questions about eligibility and assist you in completing your application. Please contact Program Coordinator Anastasia Matijkiw for assistance or additional information at (215) 545-0613 or amatijkiw@dhpsny.org. Applications are open on a biannual basis, and the next application round will be in fall 2017. David M. Rottkamp of West Islip has been appointed board chair of the New York Council of Nonprofits in Albany. 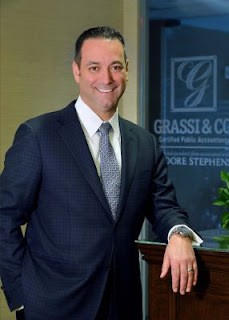 Photo Credit: Grassi & Co.
David M. Rottkamp of West Islip, a CPA and partner at Grassi & Co. in Jericho, has been appointed board chair of the New York Council of Nonprofits in Albany. Jennifer Ackroyd of Southold, assisted-living administrator and skilled nursing assistant administrator at Peconic Landing in Greenport, has joined the board of directors for the Alzheimer’s Association Long Island Chapter in Melville. Mark S. Mulholland of Bayport, partner at Ruskin Moscou Faltischek in Uniondale, has been named chairman of the board of directors at Brookhaven Memorial Hospital Medical Center in Patchogue. Brandon Kurz of Port Washington, program director at Port Washington Youth Activities, has been promoted to executive director. The YMCA of Long Island Inc. Association has expanded its leadership team with two new hires. Shannon Cussen of Manhattan has been hired as executive director of youth development and education at the association in Glen Cove. She was assistant director of the Prospect Park YMCA Early Childhood Center in Brooklyn. Frank McDonald of Oak Beach has been hired as executive director of the Huntington YMCA. He was vice president of program development and camping for the Old Colony YMCA in Brockton, Massachusetts. Small businesses across upstate are cutting hours, reducing staff and taking other measures to cope with the costs of a higher minimum wage. Nonprofit administrators, already pinched by tight budgets, are finding the minimum wage increase is adding to the daily turmoil of operating an organization dependent on dwindling government grants, donations and a pushback from clients as they try to raise fees to cover the higher wage expense. Most community-based nonprofits are locked into federal, state and local contracts that will not honor the increased employee costs that the wage increase brings, meaning that nonprofits would have to use or raise charitable dollars to subsidize the increase, said Doug Sauer, chief executive of the New York Council of Nonprofits. Most don’t have these funds to allocate so they cut back on staffing and services. As of now, the state government does not fully compensate nonprofits that they contract with for additional mandated costs of doing business, and most government contracts with nonprofits also do not pay the full cost of nonprofits’ services, Sauer said. There is a significant effort underway to see that the state does compensate the additional cost. Because of undercompensation, nonprofits either lose money on state contracts or they have to find other sources to subsidize the services the government is contracting for, Sauer said. Some nonprofits may choose to raise fees for their services. Ultimately, the increase in minimum wage harms the nonprofit industry, Sauer said. Matthew Steecker is Southern Tier regional business reporter for the USA TODAY Network. The 115th Congress convened with the majorities clearly intent to quickly repeal the Affordable Care Act (ACA, or “Obamacare”) within a month and develop a replacement plan months or even years later. That two-step strategy has now been stymied by a combination of outside advocacy efforts, financial and coverage concerns expressed by governors and moderate Republicans in Congress, and recent reaffirmation by the new President who campaigned on the immediate repeal and replacement of the landmark health care law. The Senate and House passed a budget resolution that sets the stage for repeal of the ACA in a few weeks, but leaders in the majority are now assuring their colleagues and the public that a replacement plan will be enacted in tandem with repeal legislation. Numerous nonprofits, including the Alliance for Strong Families and Children, initiated letter-writing campaigns calling on Congress not to repeal the ACA, in whole or in part, “without simultaneously replacing it with a revised program that addresses many of the concerns that nonprofits have for the people they serve.” Thirty-one states adopted Medicaid expansion under the ACA, including 16 led by Republican Governors who reportedly expressed their concerns to policymakers in Washington. Repeal without a replacement would cost those states billions in previously promised funds and disrupt state budgets for years. Senator Susan Collins (R-ME) expressed the views of many of her colleagues when she stated that repeal “risks leaving millions of vulnerable Americans without affordable health insurance and would undo important consumer protections provided by current law.” Senator Bill Cassidy (R-LA) is expected to introduce a bill soon that would partially resolve the question of a replacement plan by giving states the flexibility to keep Obamacare, abolish it entirely, or transition to a new system of health savings accounts and automatic health plan enrollment. The need for a viable replacement plan for Obamacare was underscored last week when the Congressional Budget Office warned that partial repeal without replacement would leave tens of millions of people uninsured and cause a spike in insurance premiums. President Trump has signaled that he expects the replacement of the ACA to be enacted simultaneously with repeal, but has said he will not release his legislative plan until his nominee is confirmed to lead the Department of Health and Human Services. On his first day in office, President Trump signed an executive order instructing federal agencies to use their discretion to provide maximum flexibility to states and others to reduce the costs, burdens, and mandates of the ACA, a step that some see as adding pressure on Congress to adopt a replacement law. Republican Senators and Representatives are meeting this week at a retreat in Philadelphia and the subject of a replacement health care plan is sure to be one of the most hotly debated topics. The federal spending plan for the rest of this fiscal year remains unclear, but details are emerging for the Trump budget proposals for Fiscal Year 2018 that begins on October 1. In recent speeches, Administration officials have revealed that the President will seek to reduce federal spending by $10.5 trillion over 10 years. One reported source of ideas for what to cut comes from the Heritage Foundation, a conservative DC think tank, that has offered up “106 ways to reduce the size and scope of government.” Another source is the budget plan of the Republican Study Committee, a group of deficit hawks in the House. The Heritage blueprint calls for eliminating the Justice Department’s Violence Against Women Grants, the Legal Services Corporation, and reducing funding for the Civil Rights division. It is also expected that a Trump budget proposal will seek to privatize the Corporation for Public Broadcasting and eliminate both the National Endowment for the Arts and the National Endowment for the Humanities. More details on the Trump plan are likely to be released over the next month, with his formal recommendations to Congress expected by Spring. Putting Pending Regulations on Hold: Federal departments were ordered to freeze all federal regulations currently in the pipeline to give the new Administration time to review and revise. In a memorandum from White House Chief of Staff Reince Priebus issued late Friday, bureaucrats were ordered to take no action on proposals that have not been finalized, to withdraw those sent for formal publication in the Federal Register, and to delay the implementation date for 60 days for those that have been promulgated, but are not yet effective. The memo makes exceptions for "critical health, safety, financial, or national security matters." Earlier in the week, 18 Republican state Attorneys General sent a letter to then Vice President-elect Mike Pence and Congressional leadership expressing their support for the House-passed “Regulations from the Executive in Need of Scrutiny Act of 2017 or (REINS Act), that would require the House and Senate to accept or reject within 70 legislative days rules that have an economic impact of more than $100 million. That measure has raised concerns among environmental and other advocates that the measure could hamper the work of various federal agencies. New Administration, New Look at Voting Rights: The Trump Administration successfully petitioned for delaying a hearing this week in a major voting rights case in which the Civil Rights Division of the Department of Justice successfully proved that a restrictive Texas voter identification law had a discriminatory effect on the civil rights of African-Americans and Latinos. The extension was sought to allow time for incoming officials at the Justice Department to decide the direction it wants to take in the case regarding state discrimination against minorities. Form 1023-EZ Challenged: The reliance by the Internal Revenue Service on its short Form 1023-EZ causes it to erroneously grant tax-exempt status to unqualified organizations, the National Taxpayer Advocate concluded in its Annual Report to Congress for 2016. The Form 1023-EZ, requires applicants to merely attest that they meet the requirements for qualification as Section 501(c)(3) organizations. The Taxpayer Advocate found that most applications for the exemption are now submitted on Form 1023-EZ and the IRS approves many that do not qualify under the law. The Taxpayer Advocate recommends that the IRS require Form 1023-EZ applicants to submit their organizing documents and summary financial information, and that the IRS make a determination only after considering narrative statements and this additional information. For more on the challenges and concerns about the Form 1023-EZ, read Is the 1023-EZ a Step Backward for Regulators and Nonprofits? Needed advocacy actions for the year are coming into clearer focus as governors set their agendas through State of the State addresses. Here are emerging issues and trends that could affect the work of charitable nonprofits across the country. Taxes: Taxes top the list of main issues for governors during their annual speeches. Yet as more than half of the states are facing budget deficits, most of the policy proposals focused on tax cuts rather than increases. Some, including Governor Ricketts in Nebraska, propose major overhauls in property taxes. Governor Cuomo in New York plans to work with local governments to expand property tax relief beyond a two-percent cap on increases. More than 650,000 lower-income Arkansans may receive income tax cuts totaling $50 million under Governor Hutchinson’s proposal, which also promises additional cuts in two years. In Maine, the Governor is calling on lawmakers to shift to a flat income tax by 2020, reduce the top individual tax and corporate rates, and eliminate the estate tax in 2018. Tennessee Governor Haslam’s IMPROVE Act would provide several cuts to franchise and excise taxes, resulting in $102 million in tax cuts for a state with a projected $2 billion budget surplus. Spending: Recognizing the realities of budget deficits, many governors are proposing additional spending cuts. Vermont Governor Scott is calling for tight limits on spending, while Maine Governor LePage goes further to propose a statutory limitation on spending. In addition to proposing spending cuts to many programs, New Mexico’s Governor is looking to tap accounts with unspent money to “endure this current budget crisis without raising taxes.” Missouri Governor Greitens announced spending cuts to state universities and transportation even though his overall spending plan is not expected until February. Conversely, Nebraska Governor Rickett’s budget seeks to increase spending by an annual average of 1.7 percent. Jobs/Employment: Another way governors are reducing costs is through reducing the state workforce. The Governors of Maine and Maryland are proposing to reduce state workforces by 500 and 400 positions, respectively, and North Dakota Governor Burgum suggests a ten percent cut in the number of state workers to “right-size government.” On the other hand, Wisconsin Governor Walker claims the state has more jobs than it can fill and is now shifting his priority from job creation to workforce development. ACA/Medicaid: Governors spoke to the uncertainty about the outcome of debates in Washington, DC, over the Affordable Care Act. Idaho Governor Otter is taking a wait-and-see approach on health policy, recognizing that the state impact from changes in the ACA are not yet predictable. Colorado’s Governor Hickenlooper is taking the position that “health care is a right not a privilege” and highlights that 94 percent of Coloradans are covered. Medicaid expansion and providing 640,000 low-income adults with health insurance is a top priority for Michigan Governor Snyder. Education: After years of declining support for public education, states may be changing direction. Governors from Arizona and Idaho are calling for increased funding for education and supporting teachers, with Idaho devoting 63 percent of its proposed budget to public education. Indiana Governor Holcomb seeks to double the state’s investment in pre-kindergarten, while New York’s Cuomo proposes free public college tuition for some students. Nonprofits earning money by performing government contracts are not automatically transformed into governmental entities subject to the state’s public records law, the Washington State Supreme Court ruled recently. The underlying case concerned a public records demand that an individual made on the nonprofit zoo in Seattle. When the nonprofit refused to provide all of the requested documents, the individual sued, claiming among other things that because the zoo used to be run by the city and the nonprofit zoo earned money from a city contract, it should be subject to the public records law. The trial court disagreed, and when the individual appealed, she lost again. She then appealed to the State Supreme Court. Washington Nonprofits, the state association of nonprofits, and the National Council of Nonprofits filed an amici curiae brief in the case last fall taking a strong position that extension of public records laws to private entities would effectively “insert entirely new terms into existing written agreements that private nonprofit entities have entered with governments across Washington.” The supreme court adopted a stringent four-part test to be applied on a case-by-case basis that limits expansion of the public records law to nonprofits only when entities are truly standing in the place of governmental agencies. Property Taxes: A pre-filed bill in Montana would remove the property tax exemption for any nonprofit that pays compensation greater than $250,000 to any officer, trustee, or key employee. Massachusetts legislation would require nonprofit hospitals to pay to its host municipality 75 percent of property taxes they would otherwise owe if not exempt from property taxes. The bill carves out an exception if a hospital has a standing payment in lieu of taxes (PILOT) agreement or other financial arrangement with the local government. A bill in New Hampshire would limit the property tax exemption of nonprofit hospitals to their main campuses. Health Insurance: As a sign of changing views on health insurance reform, the Republican Governor of Massachusetts is proposing the return and increase of a fine on employers with 10 or more employees that do not provide them with health insurance, raising a projected $300 million. The individual mandate under the Affordable Care Act has been a primary complaint of those seeking to repeal the law. Employment Policies: A bill in New Hampshire would increase the state minimum wage to $9.50 per hour initially and $12 per hour beginning in 2019, or defer to the federal minimum wage, whichever is higher. North Dakota legislation seeks to increase the state minimum wage from $5.85 per hour to $9.25 per hour and provide for adjustments by the state labor commissioner. A bill in Rhode Island would raise the state minimum wage from $9.60 to $10.50 per hour, effective July 1, 2017. Nonprofit Independence/Public Records: A North Dakota bill would exempt from public disclosure any donor records of nonprofits that are subject to open records laws. Currently, only donor records of nonprofits affiliated with higher education and the university system are exempt. The legislation was approved unanimously by a key Senate committee on Friday. View the testimony of the North Dakota Association of Nonprofit Organizations. State associations of nonprofits are particularly well suited to helping nonprofit leaders connect with policymakers in meaningful ways. For instance, the Maine Association of Nonprofits (MANP) recently encouraged members to strengthen relationships with policymakers and meeting newly elected members of the legislature through simply extending a hand and introducing themselves. Offering a blog post and sample phone script, along with contact information for House and Senate members, MANP makes it easy for nonprofits to say hello to policymakers. Over the past few weeks, and continuing over the next month, state associations and members are meeting with legislators in town halls, advocacy forums, and days at the capitol. The Massachusetts Nonprofit Network brought together nonprofits and government leaders at its Policymaker Roundtable to promote candid conversations about policy issues affecting the Commonwealth’s nonprofit sector. The Secretary of Health and Human Services praised the event and similar meetings as an opportunity to hear from people in the field and stressed the importance of diverse perspectives on issues. She shared with the attendees that she reads and responds to every email and urged members to contact her personally. Similarly, a Maryland state Delegate openly discussed upcoming bills and anticipated “serious cuts” in spending during the Maryland Nonprofits’ 2017 Legislative Preview. She had flown in early that morning and on little sleep stressed the importance of being there to discuss priorities during the upcoming session. Giving tacit endorsement for direct lobbying by nonprofit experts, she emphasized the delegates’ lack of staff and candidly stated she does not have time to read every bill; receiving in-depth knowledge from those in the sector greatly improves her knowledge base on any particular area. At the 2017 Session Line-Up hosted by the Minnesota Council on Nonprofits, majority and minority legislative leaders and the Lieutenant Governor spoke to more than 200 nonprofit attendees. Nonprofits had the opportunity to discuss specific missions and organizational focus with policymakers, as well as raise broad concerns on state and federal budgets and employment matters. This discussion gave the House Deputy Majority Leader the opportunity to offer a direct challenge to the nonprofits, stating, “When it comes to accessing public dollars, you will want to work really hard to prove what you’ve already done with the dollars you’ve already been given.” This comment sparked a letter to the editor from a nonprofit veteran taking issue with this demand that nonprofits must “prove their worth” and has led to more engagement for the sector. The nonprofit community must use these opportunities to build relationships to invite legislators to work with them and not against them on the issues affecting their communities.